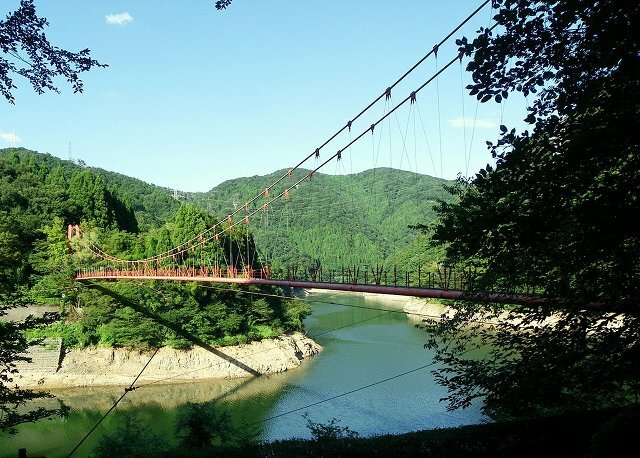 Wagatani Suspension Bridge in Ishikawa Prefecture takes walkers across Fujishano-umi reservoir. 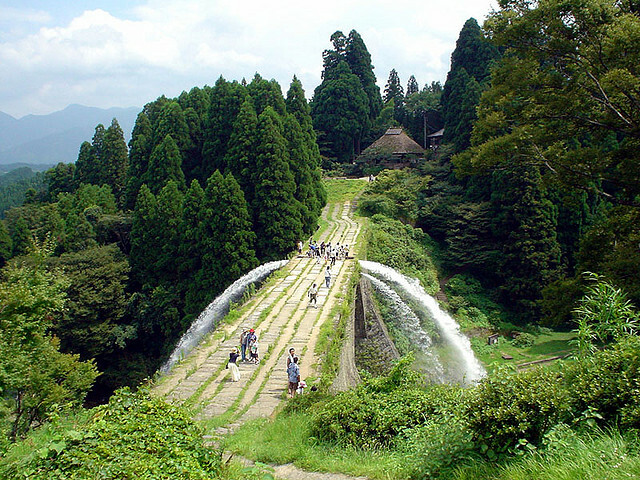 Built in 1964, it leads to a hiking trail up Mount Fujishaga-dake, which is famous for its rhododendrons. You might think that at 140 metres long it would set some sort of record, but it’s nowhere near – there are twenty pedestrian suspension bridges in Japan longer than this one. 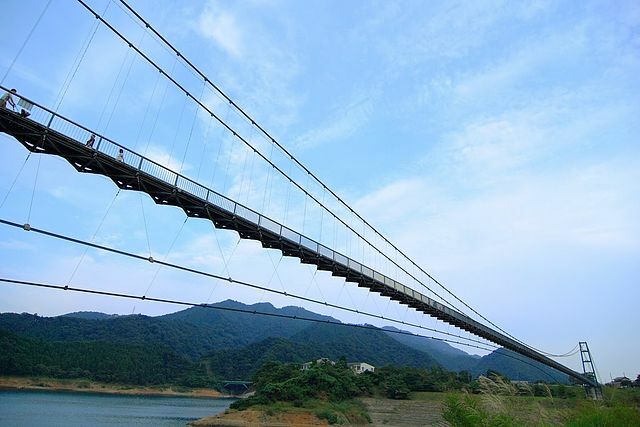 The biggest of all is Kokonoe Yume Bridge in Oita Prefecture. At 390 metres, that is the world’s longest. Japan has some truly incredible bridges, and I’ve collected the most interesting ones here so I can share them with you. While I was working on this page, I realised that most of Japan’s noteworthy bridges are footbridges, perhaps because, before railways came along, walking was really the only way to get around in Japan, unless you got someone else to carry you. There just wasn’t enough spare land available for horses to graze on, so they were restricted mainly to military use, and while ox-carts were used a bit, not many roads were really suitable for wheeled vehicles. This means that most of Japan’s old bridges aren’t big enough to carry cars, and many of them aren’t flat enough either. That said, there are some very impressive modern pedestrian bridges, but the only really interesting road bridge I came across was the 4.4 kilometre long Tokyo Bay Aqua-Line Bridge. This is almost certainly the least famous out of all the bridges on this page, but it certainly seems a remarkable bridge to me. 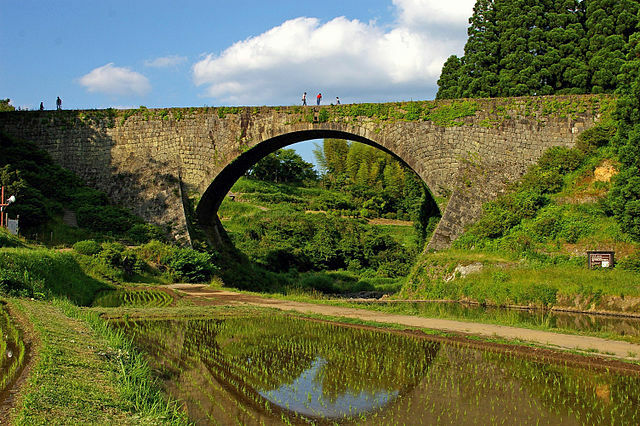 This kind of steep arched bridge can be found all over Japan, and are called ‘taiko’ bridges. This one is on a walking trail in Aomori Prefecture. No one seems to have considered it necessary to put a walkway on top of the arch so the climb up and down isn’t so steep. Here’s the same bridge in January under a thick covering of snow. Saru Bridge formed part of the old Koshu Kaido Road in Edo-era Japan, one of the five main national highways at that time. 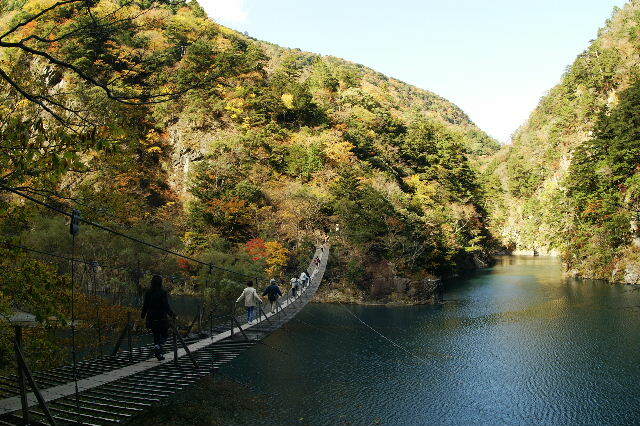 It spans a steep gorge through which flows the Katsura River, 31 metres below. 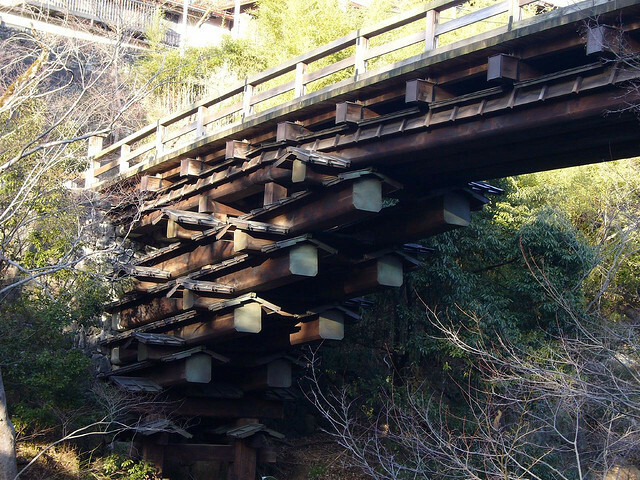 The present bridge might look very old, but it was actually built in 1984, as a replica of the Edo-era Saru Bridge. Apart from its beautiful setting, what makes Saru Bridge famous is the way it was built. Holes were made in the cliffs on each side of the gorge, and wooden beams were inserted into them. Several more layers of beams were placed on top of these, each layer sticking out a bit further towards the centre of the gorge, and then the roadway was eventually built on top of the final layer of beams. Each beam even has its own little roof to protect it from rain! 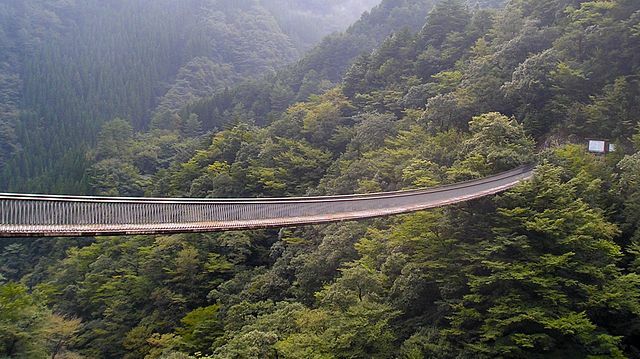 This 116 metre-long bridge crosses high over a steep ravine in Umenoki Todoro Park in Kumammoto Prefecture. It’s suspended only from its ends, so it can be very scary when you’re right out in the middle. It was built in 1989, and provides superb views of the surrounding natural scenery, especially when the leaves change colour in autumn. 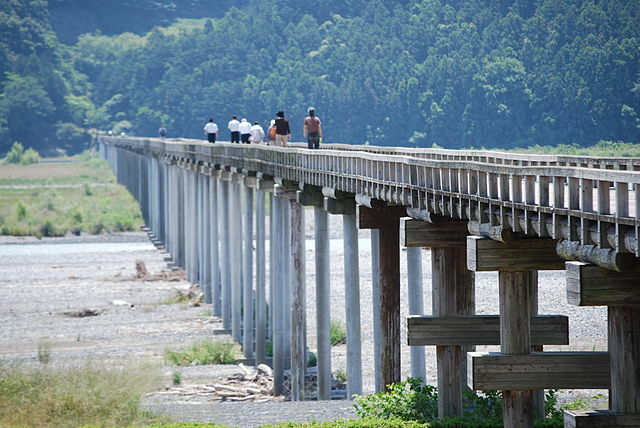 Nagare Bridge is 365.5 metres long, and is open to cycles and motorbikes as well as pedestrians. Its official name is Kozuya Bridge, and it crosses the Kizu river in Kyoto Prefecture, linking Yawata City and Kumiyama Town. Because of its old-fashioned style of construction, the bridge frequently appears in period dramas, especially samurai films and TV programmes. 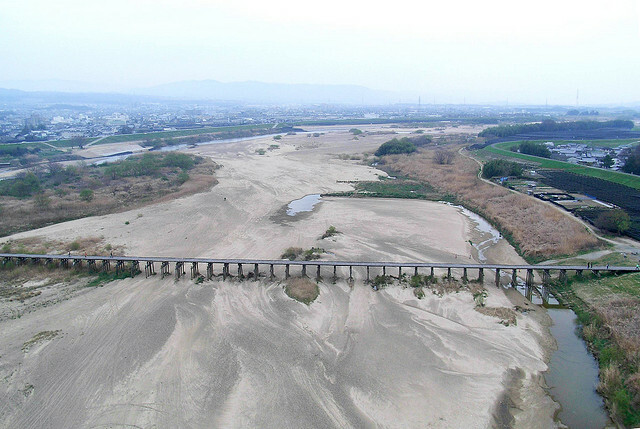 This is Nagare Bridge the day after Kyoto Prefecture was hit by Typhoon Melor. It might look like the bridge has been destroyed, but in reality it’s just that its secret defence mechanism has come into operation. The deck of the bridge isn’t attached to the vertical supports, so when the water level gets high enough, the deck just floats off. This prevents damage to the supporting structure, and as the deck is attached to the supports by wire ropes, it can simply be retrieved and re-attached afterwards. If you look closely, you can see sections of the deck floating on the water. Since it was built in 1951 the bridge has been damaged by storms eighteen times. 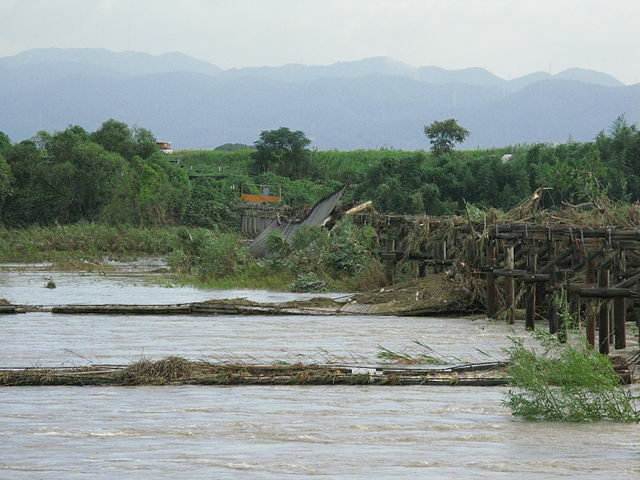 This is how Nagare Bridge looked in January 2012, following a flood in March 2011. The bridge was reopened three months later, but just over five months after that the bridge deck was washed away yet again, this time due to Typhoon Jelawat. This giant pedestrian bridge is at Lake Miyagase, a reservoir that supplies water to Tokyo. You might think that its purpose is to get from one side of the lake to the other, but you’d be wrong. It runs along the shoreline, so you could just as easily walk along underneath. Built in 1995, it is 315 metres long and well worth a visit for the great views of the lake – but I’ve got to say that I’m glad it wasn’t my taxes that paid for its construction. 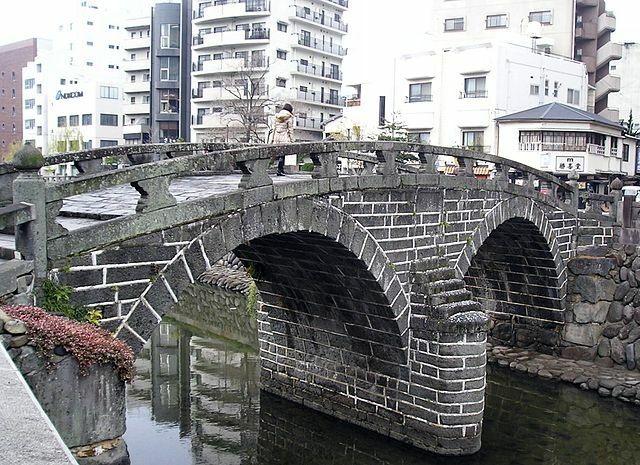 Meganebashi crosses the Nakashima River in the centre of Nagasaki City, and is reputed to be Japan’s oldest stone arch bridge, having been built in 1634. 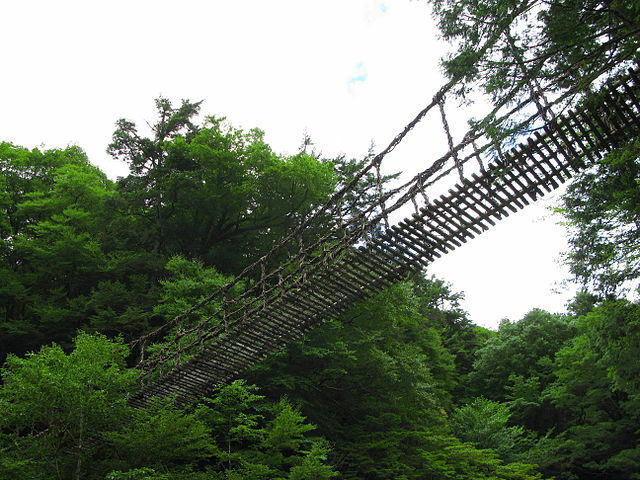 Its name translates as ‘Spectacles Bridge’ – I’m sure I don’t need to explain why. 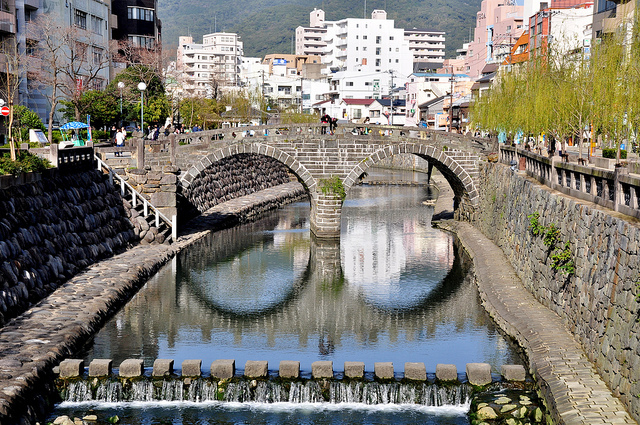 Meganebashi is one of ten seventeenth-century stone bridges crossing the Nakashima River in Nagasaki. A flood in 1982 washed away six of them, including Meganebashi, but the original stones were retrieved and used to rebuild it. I’ll leave it up to you to decide if that means it’s now really a twentieth-century bridge. Iya Valley’s vine bridge is famous throughout Japan, even though there isn’t really such a bridge – there are in fact three of them. This is the one that most people get to see, because it’s the easiest to get to. Originally these bridges were made by planting a vine on each side of the river, and growing them until they were long enough to reach more than halfway across. 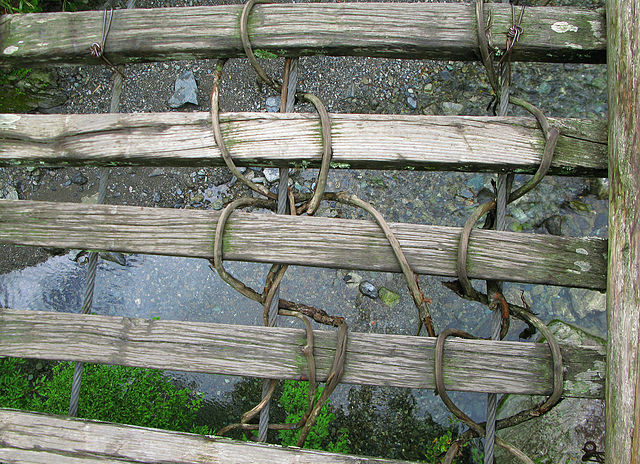 The two vines were then tied together to form a living bridge. 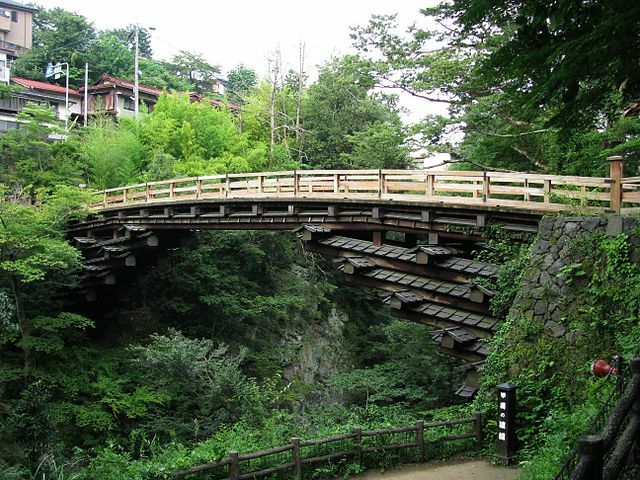 You can see a photo of this kind of bridge that was taken in the 1880s here, although that bridge was in Shizuoka Prefecture, nowhere near the Iya Valley. If you want to know more about this kind of bridge, take a look here. 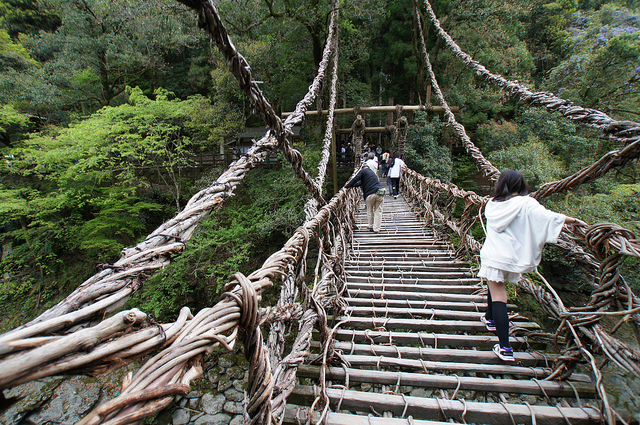 While the Iya Valley’s vine bridges survive to this day, health and safety concerns mean that they’re now reinforced with steel cables, but they’re still well worth seeing. For a fee of ¥500 yen you can get a great view as you walk 14 metres up in the air above the Iya River. This is the same bridge in December, when there aren’t many tourists around. The old living bridges used to last for many years, but this one is rebuilt every three years. 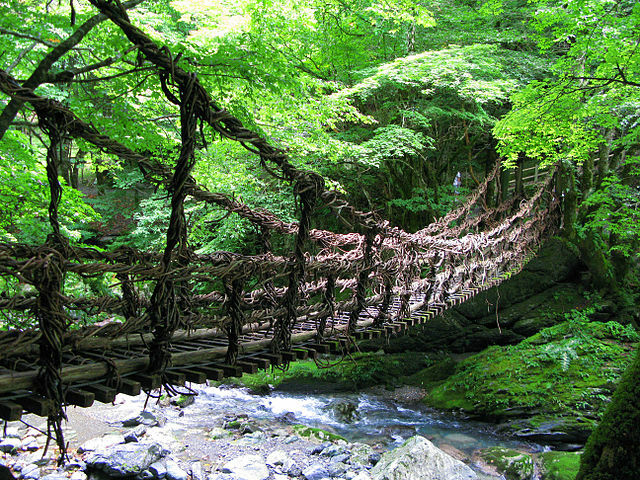 The Iya Valley used to be very remote and inaccessible, and precarious vine bridges were the only way to cross the deep ravine. 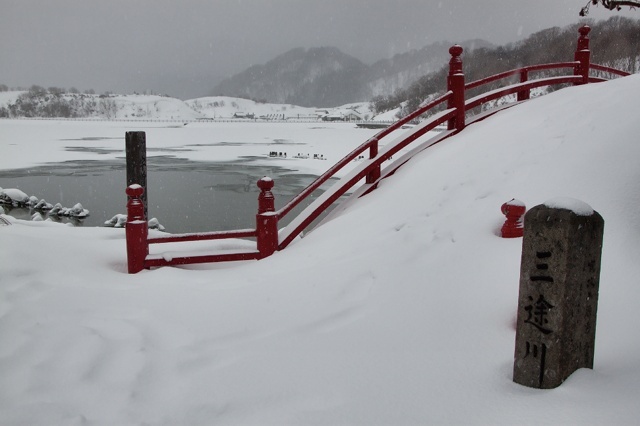 The area is said to have provided refuge for many people who were running away from something, especially samurai who had been defeated in battle. Further upriver are two more vine bridges, collectively known as the Oku-Iya Niju-Kazura-Bashi. They were reportedly built in the 1100s, but documentary evidence to support that claim seems somewhat sparse. This is the first of the pair, called Me Bashi, meaning Female Bridge. You can cross either of these two bridges for a fee of ¥500, but be warned that they’re not as stable as the better known one downriver, so it can be quite a scary experience. This is Otoko Bashi, meaning Male Bridge, just a bit further upriver. It hangs higher over the river, and is the most scary (and manly?) of the three vine bridges. This is what you see if you look down while crossing Otoko Bashi. I really don’t recommend doing so. 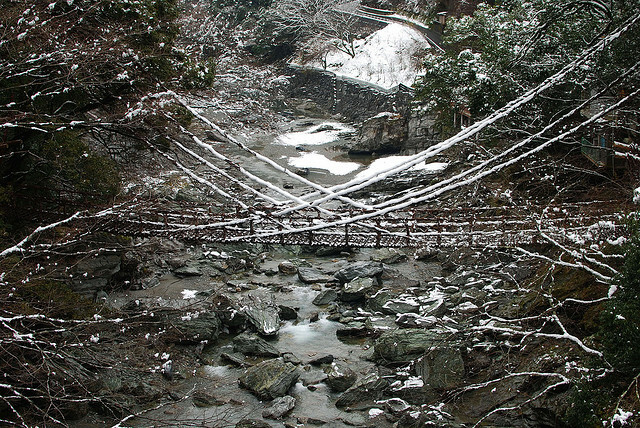 Just upstream from Me Bashi and Otoko Bashi is a ‘yaen bridge’ – meaning monkey bridge. 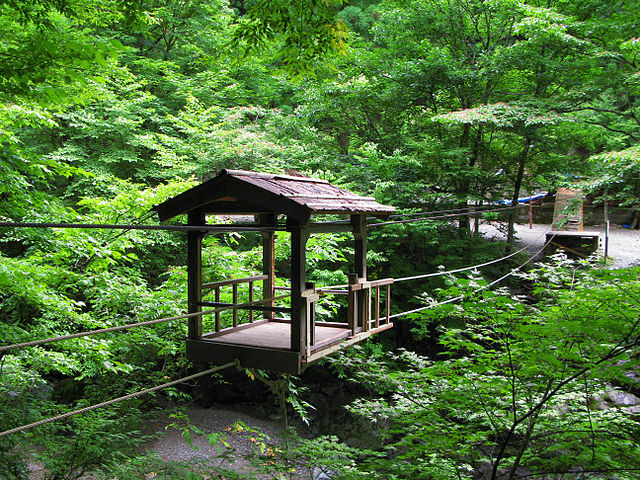 You cross this kind of bridge by sitting in the little cabin and pulling yourself across using the rope. There used to be quite a few yaen bridges in Japan, but this is one of only a handful remaining. Yes, it is a very very long way to the other end – 897 metres and forty-two centimetres to be precise. This is Horai Bridge which crosses the Oi River at Shimada in Shizuoka Prefecture. It lies on the route of the Edo-era Tokaido Highway – then the most important road in all of Japan, but the Shoguns wouldn’t allow a bridge to be built here – they wanted the Oi to remain as a barrier that would slow down the advance of any armies on their way to attack Edo (present-day Tokyo). Travellers either had to wade across the river, or pay someone else to carry them across, either in a sedan chair or just on their shoulders. The present bridge was eventually built in 1879, eleven years after the fall of the Shogunate. It’s been a toll bridge ever since it opened, the current charge being ¥100. Guinness World Records lists Horai Bridge as the longest wooden footbridge in the world, but there’s actually a much longer one (1.2 kilometres) at Amarapura in Burma. Neither of those qualifies as the longest pedestrian bridge in the world – that honour belongs to Poughkeepsie Bridge in New York State, USA – that one is over 2 kilometres long. 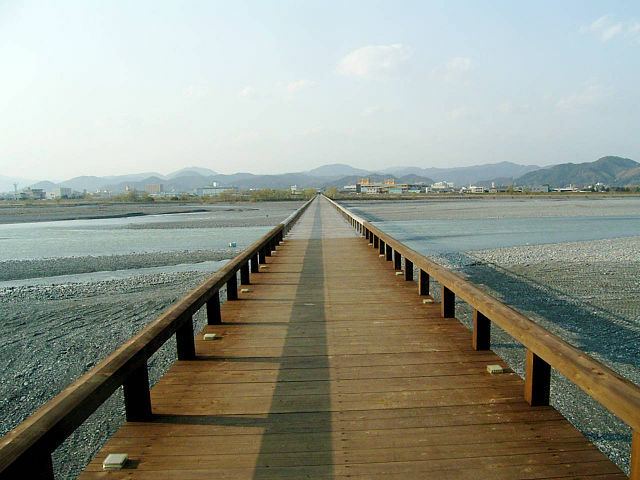 As for the longest wooden bridge in the world, I have no idea – please tell me if you know! 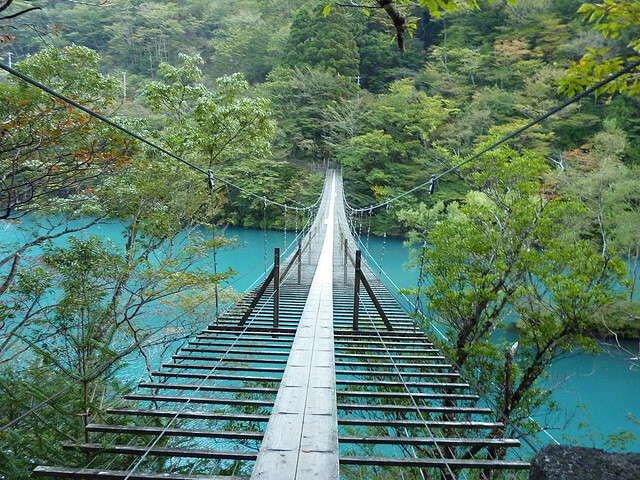 This Bridge crosses the Oma Reservoir in Shizuoka Prefecture. It’s 90 metres long and hangs about 8 metres over the water. Yes, it really is as narrow as it looks. What’s more, as you cross it shakes, creating an experience that is alternatively described as ‘thrilling’ or ‘scary’. The reservoir is famous for the emerald-green colour of its water. I’m cheating a bit with this one, as it’s really an aqueduct, but you can walk over the top so I think it just about counts as a footbridge too. Just from looking at it, you wouldn’t know it was an aqueduct as there’s no sign of any water, but that’s because it’s a ‘siphon aqueduct’. 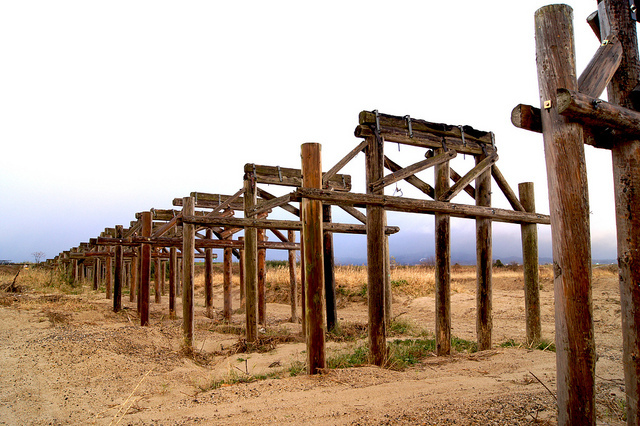 It was built in 1854 to supply irrigation water to the Shiroito Plateau. The only rivers in the area were either below the level of the plateau, or were cut off from it by the ravine through which the Todoroki River flows, so an aqueduct was needed to carry water across the Todoroki. The problem was that the Todoroki River ravine is so wide, it would have needed a really long aqueduct to cross it. The solution was to build this short aqueduct at the bottom of the ravine, and stone channels sealed with mortar down one side of the ravine, across the bridge, and up the other side. The bridge is six metres lower down than the waterways it connects on each side of the ravine, but as there’s no way for the water to get out at the bottom, it has to flow uphill and out into the watercourse on the Shiroito Plateau side of the ravine. Despite being over 150 years old, the aqueduct is still in use today – it continues to supply water to about 100 hectares of rice paddies. Water is occasionally released from inside the aqueduct, in order to flush out sand and any other debris that might have got trapped inside, but it also makes for quite a spectacular show. If you want to see it yourself, you can find the dates of the next such release on the English section of Yamato Town’s website. You can see that there’s no handrail on the bridge, but it’s claimed that no one has ever fallen off. 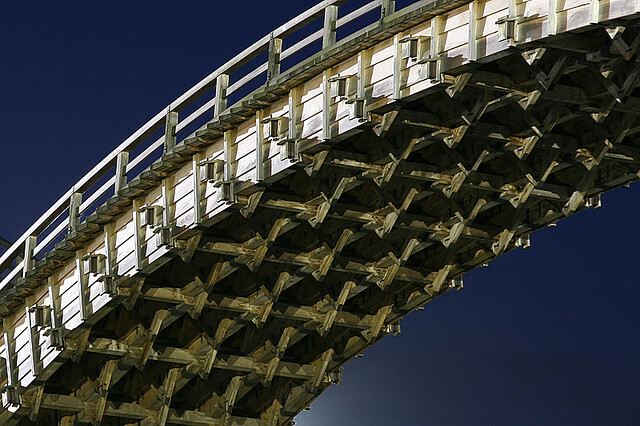 The Kintai Bridge crosses the Nishiki River in five spans linking four stone piers. Each span is 35 metres long, making for a total length of 175 metres. The bridge dates from 1673, except that the first bridge was washed away in a storm the following year. A stronger replacement was built, which lasted until 1950, when it was destroyed by a typhoon. The replacement for that bridge lasted until 2001, when a project to rebuild the wooden arches was initiated, so the present-day structure dates from 2004, when that project was completed. 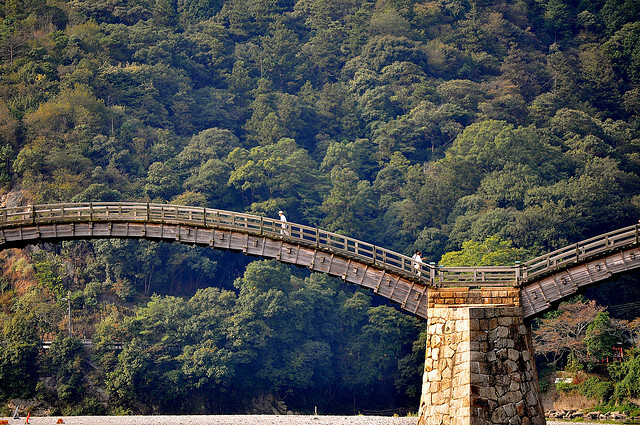 Apart from the stone piers, Kintai Bridge is made almost entirely from wood. Iwakuni City, who are responsible for maintaining it, have decided that the best way to ensure its survival isn’t so much to try and protect the existing structure from damage, but to make sure that the craft skills used to build it are maintained, so that it can be rebuilt it if (when?) it’s destroyed again by flooding. 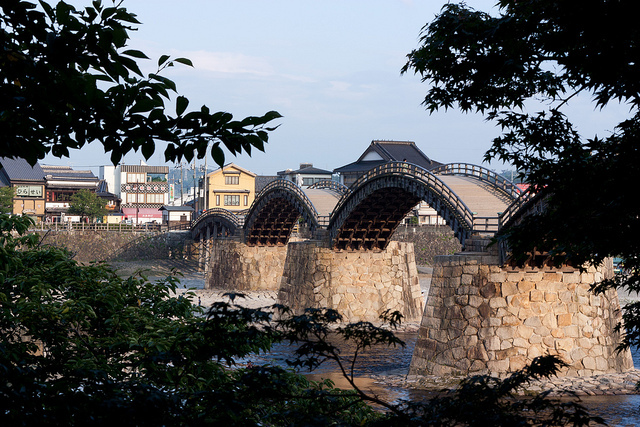 The bridge was built to link the main part of the town of Iwakuni to Iwakuni Castle. Until 1868, only the domain lord and his vassals were allowed to use the bridge, but now anyone is allowed to cross so long as they pay the ¥300 toll. 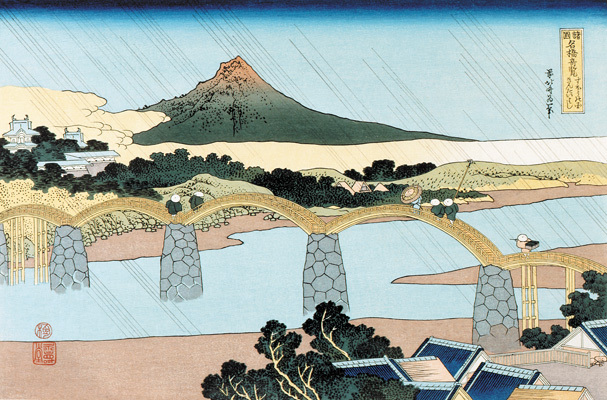 This woodblock print by the popular Japanese artist Katsushika Hokusai was published around 1831, and shows how little the bridge has changed in the last two hundred years. As can be seen in the picture, the river is usually shallow, but following storms the water level sometimes reaches right up to the level of the wooden spans. I’ll be impressed if you manage to make it to all fifteen of these bridges during your time in Japan. 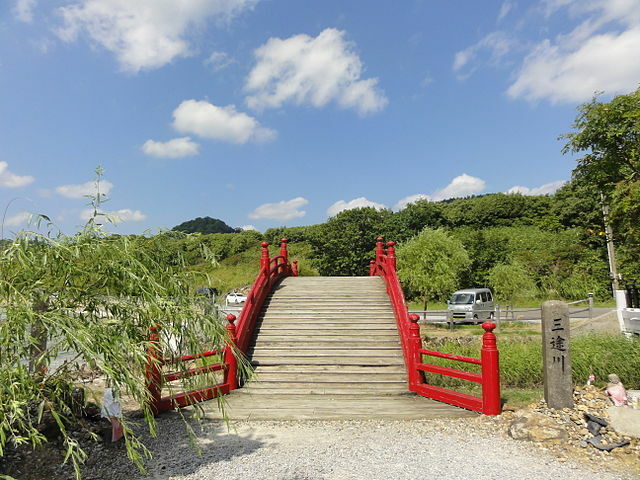 If you think that’s asking too much, you could see quite a few of these types of bridges, and more besides, at a little known park at Kojima in Okayama Prefecture. Called Ajino Park, or just ‘Bridge Park’, it’s a bridge-lovers heaven – and it’s very popular with local children too. It has miniature versions of ten different kinds of bridge, including a suspension bridge, a pontoon bridge, a yaen bridge and an Okinawan stone bridge, all of which you can cross for free!